O’Connor was born in Cork in 1903, his best writing is a sharply observed insight into the world of my grandfather (who was about the same age) – rural Ireland seen through an amused, slightly cynical but generally sympathetic eye. 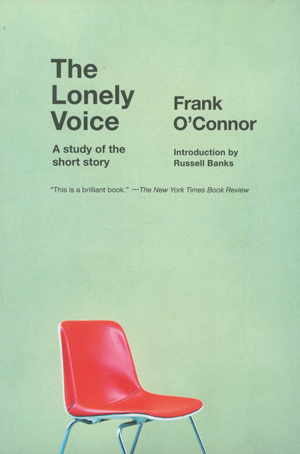 The Lonely Voice, then, is a remarkable book to be written by a man who grew up in the poorest of circumstances and received little formal education. It is based upon a series of lectures he gave at Stanford University in the early 1960s, not long before he died, and it ranges widely across the “greats” of the short story form, with chapters on, amongst others, Maupassant, Turgenev, Flaubert and Chekhov. If that all seems like it might be heavy going, it isn’t. This is not a complex work of literary theory – though O’Connor definitely has a theory of literature – O’Connor doesn’t assume a foreknowledge of any author’s work and he deals firmly in specifics, providing in these pages everything you need to know to follow his argument and encouragement to go out and grasp these writers for yourself. Even if you know nothing of these writers –and there were plenty (like Turgenev, Coppard and Katherine Mansfield) I’ve never read at all – there’s much here for anyone interested in writing. That’s mostly due to vast well of enthusiasm that drives The Lonely Voice. I recently also read The Short Story by Sean O’Faolain (O’Connor’s contemporary) which is a po-faced book full of the angst of genius and a resolute determination to show off how much O’Faolain knew. There’s none of that flummery in O’Connor – he’s covering a broad range of writers but he’s doing it with an ease born from an obvious fascination with the subject and an excitement to share his thoughts with others. I find this interesting both politically – the idea that our “critical, scientific age” (I’d call it capitalism) has removed storytelling (or rather the response to storytelling) from the public sphere (perhaps cinema filled that gap for a while, but that too has been largely overtaken by more isolating technologies) and made it a private response. I’m also interested as a writer who dabbles in genre short fiction with the sense that there is in fandom (now communicating in real-time across the internet etc.) some kind of counter-current against this privatisation of reactions to storytelling. I think of how people Twitter their responses to books almost chapter-by-chapter and to the running commentary it provides to television programmes or sporting events and I wonder if we are seeing the legacy of (or a resurgence towards) storytelling as a public art. There is no character here with whom the reader can identify himself, unless it is that nameless horrified figure who represents the author. There is no form of society to which any character in it could possibly attach himself and regard as normal. In discussions of the modern novel we have come to talk of it as the novel without a hero. In fact, the short story has never had a hero. What it has instead is a submerged population group… That submerged population changes its character from writer to writer, from generation to generation. It may be Gogol’s officials, Turgenev’s serfs, Maupassant’s prostitutes, Chekhov’s doctors and teachers, Sherwood Anderson’s provincials, always dreaming of escape. […] The submerged population is not submerged entirely by material considerations; it can also be submerged by the absence of spiritual ones, as in the priests and spoiled priests of JF Powers American short stories. There’s a sharp contrast here between the advice most often handed out to writers (certainly in genre and often in magazine guidelines) – make your characters sympathetic, make them active, make them heroic (anti-heroic or post-heroic, at least in terms of their ability to change their own circumstances) and this emphasis on the importance of “submerged populations” – the outcasts, the ignored and the embarrassing. What is notable too is the way this vision of the subject of the short story is entirely antithetical to the Campbellian omnicompetent engineer who story revolves around his determination to solve problems. While the modern novel and the short story are, for O’Connor, born from the same sources, they are fundamentally different. Formally, the differences between the short story and the novel are not just related to length – though that’s clearly important. Here again, the contrast between this literary definition of a short story and what is common in genre writing is striking. This reflects one of the trends I’ve noticed reading slush piles – many genre short stories are mini novels – they begin with a question, fiddle around in the middle and then come to a conclusion in which everything is packed up and put neatly away – there’s no sense of them belonging to a broader universe, let alone their characters having lives beyond the limits of the restricted word count. They are determined to be complete. Not that the urge to tinker doesn’t have its downsides. And O’Connor notes that Joyce, who produced just one masterful collection of short stories, never returned to the form because he became too much concerned with the art of writing. O’Connor himself, both in this book and in his own work, doesn’t dabble much with the arcane arts of technical experimentation. Too much art meant the short story “no longer rang with the tone of a man’s voice speaking” (28) – something central to his conception of the art form. The introduction to this book suggests that some of the young writers in the class he gave at Stanford thought him hopelessly old-fashioned – it’s not hard to see why that might be so. There is, for him, a fine line to be walked between art and nature. In discussing Turgenev’s work, he returns to the difference between the novel and the short story. Turgenev’s novels are short and his novelettes and short stories are frequently long and marking the dividing line between them is not easy. I’m not sure that we’re likely to be able to convince the folk behind the Hugo that this is the best way to delineate the novelette and novel categories in the future, but I think it’s a fascinating and potentially useful way for a writer to think about what they’re writing. The essay on Maupassant is interesting not least the fact that O’Connor reports that “sixty-five of his stories which have circulated in America are not by Maupassant at all” (69). O’Connor is enthusiastic about Maupassant’s writing and his championing of a “submerged population,” but I think he hits the nail on or about the head when he notes that there is something “unsatisfactory” in his work. This is a genuine problem – one that continues to trouble writers and which seems to be taking greater significance in considerations within genre as concerns about equality and postcolonial theories of criticism steadily gain ground. It is also, I think, a question no-one has successfully answered. The most obvious answer, that those in positions of privilege should not write about the lives of those exploited, seems straightforward enough but the actual effect would be to make these “submerged populations” all-but invisible in mainstream art and the media and that would, I think, be both counterproductive (allowing the privileged to ignore their wider responsibilities) and dangerous (encouraging isolationism, reaction and, ultimately, deepening damaging divisions). In his discussion of Kipling, O’Connor recognises that not all short stories are necessarily written for private consumption. Kipling’s stories directly address an audience, O’Connor reckons this was because Kipling was psychologically incapable of facing a crises on his own due to a weakness in his character or in the British imperial class (O’Connor was an IRA man in the war for independence and the subsequent civil war). I suspect that it was an utter inability to face crises alone, and that this was something he had acquired from his upbringing as a little member of a colonial group, the impression was that one was never alone or at least never should be alone. If one were left alone, nightmare succeeded. O’Connor can’t shake off a sneaking regard for Kipling: “As a weak man I like to believe that not only is God watching over me but the Eleventh Hussars are keeping an eye on me as well. As a mature one I know that Kipling is a damned liar.” (109) – but he’s hardly alone in that. Even Edward Said (of Orientalism) had a soft spot for Kim. I’m not going to try to construct a tortured metaphor to link the modern American tradition of sf (America is a country that defines itself as constantly being the plucky underdog against vast forces moving against it – the British Empire, Communism, Islamism…) and O’Connor’s notion of Kipling’s beleaguered colonials but I think it is interesting to note that of all the writers considered in The Lonely Voice, the typical Kipling story is the type most similar to the typical sf story. Not all of The Lonely Voice is easily digestible today. It will be quickly become clear that this book is primarily about white male authors. O’Connor does mention his admiration for existing and emerging traditions amongst Caribbean and Indian writers – recognising in them the concern with “submerged populations” that defines his vision of the great short story – but none are directly discussed in depth. The chapter on Isaac Babel – a Russian Jew – is both admiring and full of questions about authenticity that raise the character of his specifically Jewish insight in a way that is different from the standards O’Connor applies to other writers considered here (although I suppose Kipling’s imperial British prejudices do get a going over too). And women don’t fair particularly well either. His admiration for the stories of Mary Lavin doesn’t stop him comparing her to an over-enthusiastic schoolgirl and, of his analysis of the work of Katherine Mansfield I could at best, generously, say that it is “of its time and place” but, less generously, I might simply point out that it is horrendously sexist and peculiarly obsessed with her sexuality to the point of homophobia. Whether the modern reader can live with the problematic chapters in The Lonely Voice will, I suppose, depend on whether they can categorise them as archaisms, cultural baggage, that a writer (whose major concern in his work to draw attention to the outcast and the “submerged”) could not shake off. They come together in a chunk towards the end of the book and their crudeness is a shock given the sentiments that preceded them. I may be overly prone to give O’Connor some leeway. His short stories – though not themselves sentimental – stir up, for me, half-remembered images and family legends and the kind of simpering, maudlin, romanticism that I hate in other Irishmen. I’m willing to place him in context – as emerging from a society in which certain prejudices were so heavily engrained that seeing through them at all, however imperfectly, required a degree of bravery and determination. Others might not be as generous. As I’ve noted, I’ve not read Mansfield’s work and don’t know if this criticism of her work is fair, but there’s something in the general point that an obsession with having ‘experiences’ is common amongst a certain type of aspiring writer and it isn’t always balanced by an ability to critically assess those experiences in a grown-up way. This entry was posted in Friday Words of Wisdom and tagged books, friday wisdom, review, reviews, Writing. Bookmark the permalink.